The best preserved of all ancient Roman buildings, and one of the world's finest architectural masterpieces. The simplicity of the Pantheon is breathtaking: a circular rotunda with a rectangular porch, each of perfect proportions and joined together without decoration. It was built in the 2C AD by Emperor Hadrian, who also designed his beautiful country house, Villa Adriana. meaning "Marcus Agrippa, son of Lucius, in his third consulate, made it" (L: F: COS = Luci filius Consul). Hard to tell if Hadrian was being selfless or self-serving in attributing his temple to the much-loved Agrippa, ancient Rome's most popular founding father. Take in the majesty of those 16 soaring columns in front; each is a solid shaft of granite. The massive bronze doors may well be the original ones; they can still swing effortlessly on their hinges. Hadrian's greatest engineering feat was designing this enormous dome with a large hole in the top - the oculus. His solution was to divide the construction into a series of 6 rings, one on top of the other, each made of different building materials and with different thickness, which get lighter and thinner as they rise up. The massive base is of solid travertine; the lowest ring is a 20-foot thick drum of mixed travertine and volcanic tufo; the next is a thinner drum of tufo and brick; then just brick; then brick and pumice stone; finally the rim of the oculus, only 4.5 foot (1.5 m) thick, contains hollow earthenware pots supported by pumice stone. The dome's 142 foot (43 m) span is even greater than that of St. Peter's Basilica. As for perfection of proportions, the interior height from floor to oculus is the same, 142 feet (43 m), meaning that a ball with that diameter would fit snugly inside the Pantheon's rotunda. Hadrian synthesized the old with the new: Greeces old temple form - an open group of tall columns topped by a triangular pediment - with Rome's new hemispherical dome. It sounds simple, but nobody has equaled it. Now go inside and experience the shock of that oculus, the only source of light for the whole building. Nine yards/meters across, it lets in a dazzling amount of light and symbolizes the Sun, the source of life. We've never had the opportunity, but have heard that on nights with a full moon the view of that great orb through the oculus is an unforgettable experience. The great Renaissance painter Raphael (Raffaello Sanzio) chose to be buried here, as did the first two Kings of Italy. Our favorite: you should try to visit the Pantheon when there is a storm; rain pouring down in a perfect circle on the marble floor is astounding. And if you also get thunder and lightning, you will count that visit among your most precious memories of any time, any place. 27 BC. 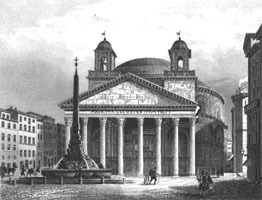 Consul Marcus Agrippa, son-in-law of Emperor Augustus, built a small Greek-style square temple, dedicated to "all gods" (Pantheon). Its entrance was to the South, facing his complex of baths, basilica and gardens. 118-125 AD. Emperor Hadrian incorporated Agrippa's temple into the portico of the temple you see today, and turned the entrance around to the North. 655. One of Phocas' successors, Constant II, took away the fine bronze tiles covering the cupola for his capital in Constantinople, but they were hijacked by Arabs, ending up in Egypt. Served him right! 1623-44. Pope Urban VIII Barberini stole the bronze beams from the portico and had them melted down for metal to make Bernini's baldacchino in St. Peter's and some cannon balls for Castel Sant'Angelo. This provoked the talking statue of Pasquino to say "What the Barbarians didn't do, the Barberinis did" ("quod non fecerunt barbari, fecerunt Barberini"). Hours: 9 am - 4:30 pm (winter) and 9 am - 6 pm (summer) Monday through Saturday. Opened Sundays from 9 am to 1 pm.